The Vendée has such wonderful landscapes and a people who are at home with nature that it is no wonder that artists flock here to capture the mood, colours and all those other things that artist crave. Although of course anywhere and anything can be an inspiration for an artist, there are a few places here in the Vendée that seem to draw artists in great numbers. The list below features some but by no means the only places that attract those with an artistic bent. Ile d'Yeu. 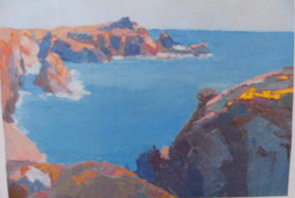 The island of l'Ile d'Yeu has all the ingredients for an artist's paradise, Quaint harbours, rocky cliffs and seascapes, boats of all description, fishermen of character and their equipment, colourful cottages and a lot more, it is no wonder there are so many artists galleries and workshops here. Ile de Noirmoutier. As with the Ile d'Yeu the island of Noirmoutier has all the ingredients to attract artists, with the addition of sea salt pans and the passage du gois there are endless topics to be captured. Green Venice. 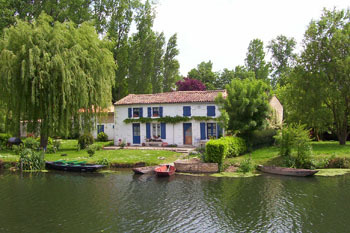 The part of the Marais Poitevin known as the Green Venice has attracted artist of all types, not only painters, but photographers and sculptures for decades. They come to capture the shades of green, the pretty cottages and a way of life that still lingers from a time long past along with so many more other aspects of this enchanting corner of the Vendée. Vouvant. Known as "le village de peintres", Vouvant has 13 resident artists and art galleries hosting painting events through the year. The draw to Vouvant is a combination of things, it is one of the prettiest villages in France, there is medieval history everywhere and there is a sense of time stood still that evokes a passion to paint. Mallievre. Just like Vouvant, the pretty village of Mallievre on the River Sèvre Nantaise is a magnet for artists. The combination of a beautiful river lined with rounded boulders, watermills and other old and attractive buildings set in a tranquil landscape all make this small village something special for artist. River Sèvre Nantaise. . Though Mallievre may be a village that particularly attracts artists, the whole of the river Sèvre Nantaise that borders the north east corner of the Vendée is beautiful. The river has some 140 watermills of various description with their adjacent weirs, there are viaducts that cross wooded valleys and the river itself has rounded boulders strewn virtually all along its length making not only ideal scenes for the artist to capture, but just as important a most enjoyable environment for everyone to explore and relax in.